With this worksheet your third graders will enjoy learning important facts about the Statue of Liberty and strengthen their vocabulary. 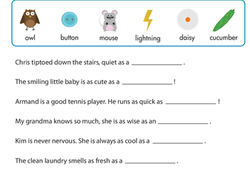 Use your vocabulary know-how to locate the missing word and complete the sentence! What is the rocky cycle? This info sheet answers that question with the help of a colorful diagram and a shout out to important vocabulary. 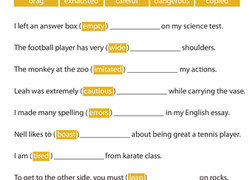 Each sentence on this year four reading worksheet has a highlighted word, and kids write in an antonym for the word to complete the sentence. When your students come across a new or important word, use this worksheet to help them gain a better understanding of the word. 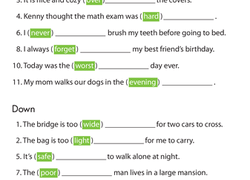 On this year four reading worksheet, each crossword puzzle clue is a sentence with a highlighted word. Kids write the antonym of the word in the puzzle. Use this resource to review important vocabulary terms in the genre of fiction. Use this resource for your students to practise using context to determine word meanings.